Here we are providing difference between SSA vs PPF account. SSA is Sukanya samriddhi account and PPF is Public providend fund. The new budget has laid quite an emphasis on the role of girl child in the overall progress of the country and hence has come up with an excellent scheme to make the girl child empowered in all aspects. Under the campaign, ‘Beti Bachao, Beti Padhao’, Government of India has launched Sukanya Samriddhi Yojana through which parents can ensure a that this small saving investment scheme would take care of their daughter’s future. You can open PPF account for Boy child of any age and Girl child who have crossed age limit in SSY. The SSA (Sukanya Samriddhi Account) offers quite a lucrative interest rate along with other benefits and is thus often compared with PPF (Public Provident Fund) in regards to tax saving aspects. Below mentioned is a comparison of both the saving schemes. PPF can be opened for any Indian citizen, irrespective of gender and class. There is no minimum or maximum age limits for opening of a PPF account. However, SSA can only be opened for girls below the age of 10 years. Who can open and operate the account? PPF can only be opened by the individual who wants to have an account. SSA would be opened for the girl child by her parents or the legal guardian. After the girl turns 10 years of age, she can herself operate the account. A PPF account can be opened at any nationalized as well as private banks along with all the post offices. One the contrary, SSA can be opened at all post offices, but can only be opened at nationalized banks and a select of private sector banks authorized by the Reserve Bank of India. In both SSA and PPF, the maximum contributions per year is limited to Rs 1,50,000. You need to deposit a minimum of Rs 1,000 in SSA, whereas just Rs 500 in case of operating a PPF account. The rate of interest in both PPF and SSA is higher as compared to other small saving schemes. If you invest in PPF, you receive 8.10% per annum for the financial year 2016-17. In case of SSA, the rate of interest is 8.5% per annum for the financial year 2016-17. It is to be noted here that the rate of interest in both these saving schemes keeps changing every fiscal year and is based on the overall health of the economy. In both PPF and SSA, the contributions made towards the account are exempted from income tax under section 80C. However, in PPF, even the interest is exempted from taxes, which is not the case in SSA. The minimum period of investment in SSA is 14 years from the date when the account is opened. In case of PPF, it is a minimum of 15 years during which the contributor has to deposit money. After 15 years, it is up to the account holder if he wishes to proceed with the deposits. A SSA for a girl child matures only after 21 years from the date when account was opened. However, a PPF matures much earlier, i.e. 15 years from the date of opening of account. Someone having a PPF account is not entitled for any premature withdrawal in normal conditions. The account holder can although opt from a premature withdrawal after 7th year of investment, but should be only 50% of the balance amount till 4th year. In case of SSA, the account holder (girl child) can opt for a premature withdrawal of 50% of the accumulated amount in conditions of marriage or higher education, but only after she has attained an age of 18 years. 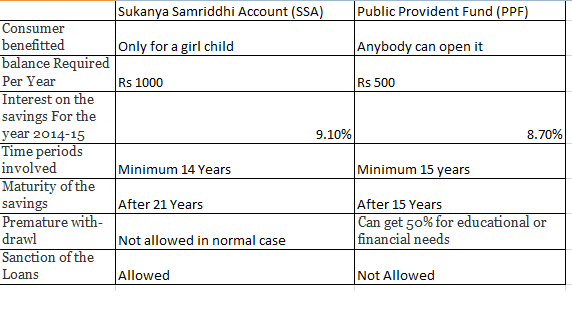 No loan facility is entitled in case of Sukanya Samriddhi Account. However, someone who has a PPF account can certainly opt for a loan after third year of opening of account. Overall, both schemes are a wonderful option for saving under small saving schemes in India. It is just that both have their own intent as well as investment and security is concerned. PPF is a general saving scheme with higher returns to secure one’s future, whereas, SSA is specifically designed to secure the future of a girl child so that her upbringing does not become a burden for her parents.